You can use this app to start and stop impressions and to unarchive campaigns. How do I start and stop impressions? How can I unarchive a campaign? 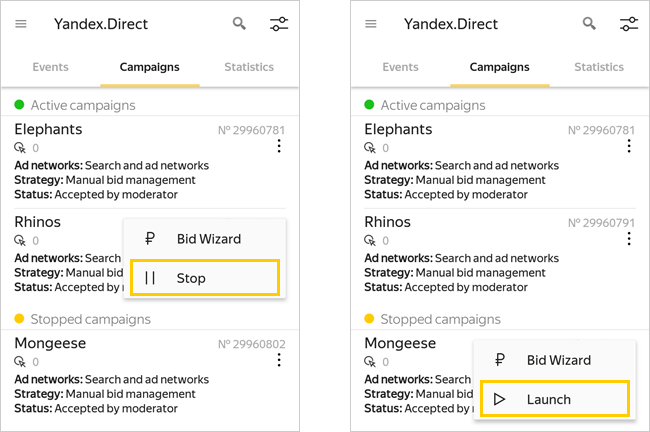 You can start and stop campaigns, ad groups, ads and keywords. In the corresponding list, find the appropriate element and tap → Stop or Launch. 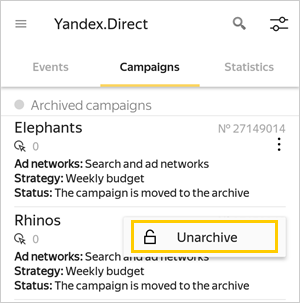 In the campaign list, find the one that you need and tap → Unarchive. After you unarchive the campaign, it is marked "stopped"; you have to tap Launch if you want the campaign to run again. Additionally, the campaign may automatically be sent for re-moderation. In this case, the ads will not be served until they pass moderation. Note. Campaigns can not be archived using the app. How do I start and stop impressions?How can I unarchive a campaign?